The Society of Homeopaths have a Code of Ethics, but seem to ignore it. I wonder why! Two new members have been appointed to the Society’s Public Affairs (PAC) and Professional Standards (PSC) committees for three-year terms of office. Selina Hatherley RSHom is joining the PAC. She has been a member since 2004 and works in three multi-disciplinary practices in Oxfordshire and previously ran a voluntary clinic working with people with drug, alcohol and mental health issues for 12 years. She has also been involved in the acute trauma clinics following the Grenfell Tower fire in 2017. New to the PSC is Lynne Howard. She became a RSHom in 1996 and runs a practice in three locations in east London and a major London hospital. She specialises in pregnancy, birth and mother-and-baby issues. “Following an open and comprehensive appointment process, we are delighted to welcome Selina and Lynne ‘on-board’ as brand-new committee members who will bring new ideas, experiences and knowledge to the society,” said Chief Executive Mark Taylor. It seems to me that the SoH might be breaching its very own Code of Ethics with these appointments. 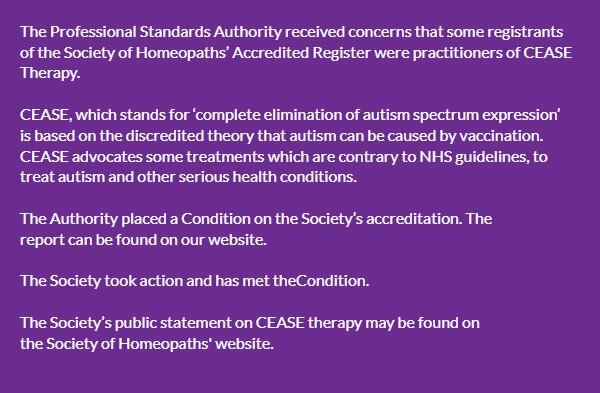 1) Lynne Howard BA, LCH, MCH, RSHom tells us on her website that she has been practising homeopathy for 25 years, she has run many children’s clinics and is a registered CEASE practitioner with a special interest in fertility and children’s health. CEASE therapy has been discussed before on this blog. It is highly unethical and the SoH have been warned about it before. They even pretended to take the warning seriously. 2) Selina Hatherley has a website where she tells us this: In 2011 I trained as a Vega practitioner – enabling me to use the Vega machine to test for food sensitivity and allergens. I use homeopathic remedies to support the findings and to help restore good health… I am a registered member of the Society of Homeopaths – the largest organisation registering professional homeopaths in Europe, I abide by their Code of Ethics and Practice and am fully insured. Vega, or electrodermal testing for allergies has been evaluated by the late George Lewith (by Jove not a man who was biased against such things) and found to be bogus. Here are the conclusions of his study published in the BMJ: “Electrodermal testing cannot be used to diagnose environmental allergies.” That’s pretty clear, I think. As the BMJ is not exactly an obscure journal, the result should be known to everyone with an interest in Vega-testing. And, of course, disregarding such evidence is unethical. But perhaps, in homeopathy, ethics can be diluted like homeopathic remedies? Perhaps the SoH’s Code of Ethics even allows such behaviour? 1.1 Put the individual needs of the patient first. 1.2 Respect the privacy and dignity of patients. 1.3 Treat everyone fairly, respectfully, sensitively and appropriately without discrimination. 1.4 Respect the views of others and, when stating their own views, avoid the disparagement of others either professionally or personally. 1.5 Work to foster and maintain the trust of individual patients and the public. 1.6 Listen actively and respect the individual patient’s views and their right to personal choice. 1.7 Encourage patients to take responsibility for their own health, through discussion and provision of information. 1.8 Comprehensively record any history the patient may give and the advice and treatment the registered or student clinical member has provided. 1.9 Provide comprehensive clear and balanced information to allow patients to make informed choices. 1.10 Respect and protect the patients’ rights to privacy and confidentiality. 1.11 Maintain and develop professional knowledge and skills. 1.12 Practise only within the boundaries of their own competence. 1.13 Respond promptly and constructively to concerns, criticisms and complaints. 1.14 Respect the skills of other healthcare professionals and where possible work in cooperation with them. 1.15 Comply with the current statutory legislation in relation to their practice as a homeopath of the country, state or territory where they are practising. 1.16 Practise in accordance with the Core Criteria for Homeopathic Practice and the Complementary and Natural Healthcare National Occupational Standards for Homeopathy. I let you decide whether or not the code was broken by the new appointments and, if so, on how many accounts. Lock 10 bright people into a room and tell them they will not be let out until they come up with the silliest idea in healthcare. It is not unlikely, I think, that they might come up with the concept of visceral osteopathy. In case you wonder what visceral osteopathy (or visceral manipulation) is, one ‘expert’ explains it neatly: Visceral Osteopathy is an expansion of the general principles of osteopathy which includes a special understanding of the organs, blood vessels and nerves of the body (the viscera). Visceral Osteopathy relieves imbalances and restrictions in the interconnections between the motions of all the organs and structures of the body. Jean-Piere Barral RPT, DO built on the principles of Andrew Taylor Still DO and William Garner Sutherland DO, to create this method of detailed assessment and highly specific manipulation. Those who wish to practice Visceral Osteopathy train intensively through a series of post-graduate studies. The ability to address the specific visceral causes of somatic dysfunction allows the practitioner to address such conditions as gastroesophageal reflux disease (GERD), irritable bowel (IBS), and even infertility caused by mechanical restriction. But, as I have pointed out many times before, the fact that a treatment is based on erroneous assumptions does not necessarily mean that it does not work. What we need to decide is evidence. And here we are lucky; a recent paper provides just that. 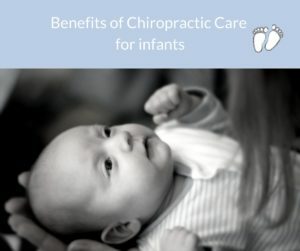 The purpose of this systematic review was to identify and critically appraise the scientific literature concerning the reliability of diagnosis and the clinical efficacy of techniques used in visceral osteopathy. Only inter-rater reliability studies including at least two raters or the intra-rater reliability studies including at least two assessments by the same rater were included. For efficacy studies, only randomized-controlled-trials (RCT) or crossover studies on unhealthy subjects (any condition, duration and outcome) were included. Risk of bias was determined using a modified version of the quality appraisal tool for studies of diagnostic reliability (QAREL) in reliability studies. For the efficacy studies, the Cochrane risk of bias tool was used to assess their methodological design. Two authors performed data extraction and analysis. Extensive searches located 8 reliability studies and 6 efficacy trials that could be included in this review. The analysis of reliability studies showed that the diagnostic techniques used in visceral osteopathy are unreliable. Regarding efficacy studies, the least biased study showed no significant difference for the main outcome. The main risks of bias found in the included studies were due to the absence of blinding of the examiners, an unsuitable statistical method or an absence of primary study outcome. The authors (who by the way declared no conflicts of interest) concluded that the results of the systematic review lead us to conclude that well-conducted and sound evidence on the reliability and the efficacy of techniques in visceral osteopathy is absent. It is hard not to appreciate the scientific rigor of this review or to agree with the conclusions drawn by the French authors. But what consequences should we draw from all this? The authors of this paper state that more and better research is needed. Somehow, I doubt this. 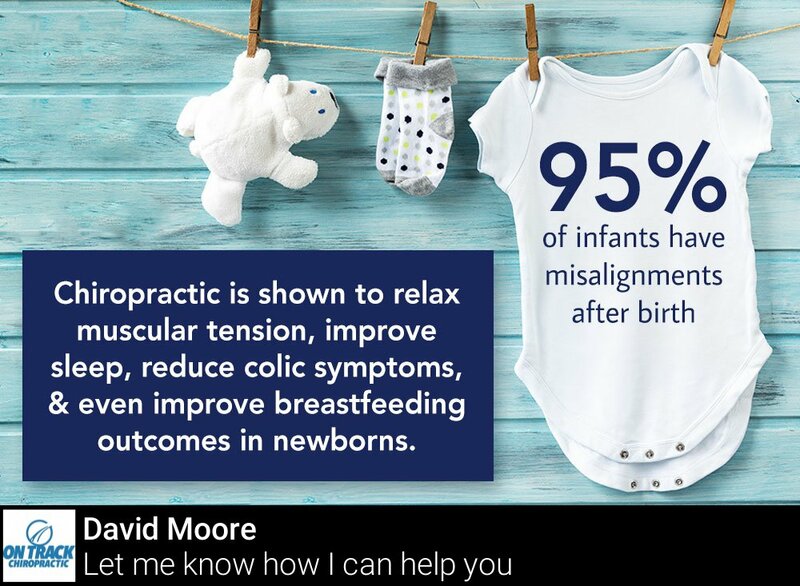 Visceral osteopathy is not plausible and the best evidence available to date does not show it works. In my view, this means that we should declare it an obsolete aberration of medical history. To this, the proponents of visceral osteopathy will probably say that they have tons of experience and have witnessed wonderful cures etc. This I do not doubt; however, the things they saw were not due to the effects of visceral osteopathy, they were due to chance, placebo, regression towards the mean, the natural history of the diseases treated etc., etc. And sometimes, experience is nothing more that the ability to repeat a mistake over and over again. IT MOST LIKELY IS A PLACEBO!!! And what is wrong with a placebo, if it helps patients? WE HAVE ALREADY DISCUSSED THIS AD NAUSEAM. JUST READ SOME OF THE PREVIOUS POSTS ON THIS SUBJECT. Does the tolerance of extreme quackery make acupuncturists quacks? Acupuncture Today is a much-read online publication for people interested in acupuncture. It informs us that Chinese medicine is quite complex and can be difficult for some people to comprehend. This is because TCM is based, at least in part, on the Daoist belief that we live in a universe in which everything is interconnected. What happens to one part of the body affects every other part of the body. The mind and body are not viewed separately, but as part of an energetic system. Similarly, organs and organ systems are viewed as interconnected structures that work together to keep the body functioning. To me, this sounds suspiciously woolly. Do they think that conventional healthcare professionals view the various body-parts as separate entities? Do they feel that conventional practitioners see the mind entirely separate from the body? Do they believe others fail to realize that what affects the brain does not affect the rest of the body? These common preconceptions have always puzzled me. Intrigued, I read on. Elsewhere we learn that Acupuncture Today and acupuncturetoday.com are the only complete news sources in the profession and we don’t take this honor lightly. The acupuncture and Oriental medicine profession is a blend of ancient traditions, healing styles and modern therapies. We provide content that is comprehensive enough to appeal to each of the profession’s diverse groups. In addition, we provide a complete suite of additional products including newsletters, calendars and classifieds that provide our advertisers with the contextual platform they need to communicate with our readers, their customers. …When the mandible cannot open due to a spasm, the chief symptom is pain. 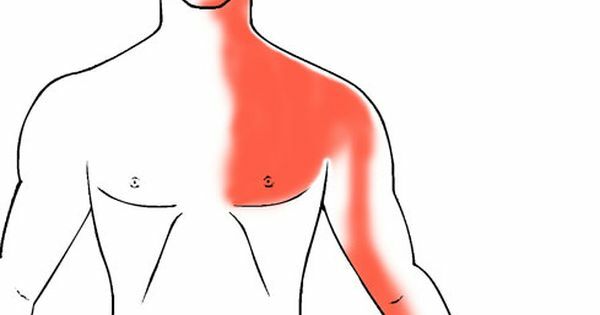 Until energy is restored, the muscle cannot lengthen and pain cannot be eliminated. Acupuncture is a good way to correct this condition without the use of a dental appliance. Dentists specializing in treating TMJ use a computerized equipment scan (electrosonography), surface electromyography and the myomonitor to relax the muscles. Dowsing is a diagnostic aid that has been used for other situations and can be very helpful to acupuncturists. In conclusion, I feel that remote dowsing is a great approach to diagnosis and treatment. If I had not seen alternative practitioners doing this procedure with my own eyes, I might have thought the article is a hoax. Sadly, this is the ‘real world’ of alternative medicine. I tried to find some acupuncturists who had objected to this intense nonsense, but I was not successful in this endeavour. The article was published 6 years ago (no, not on 1 April! ), yet so far, nobody has objected. I have also tried to see whether articles promoting quackery of this nature are rare exceptions in the realm of acupuncture, or whether they are regular occurrences. My impression is that the latter is the case. In a previous post about quackery in chiropractic, I have argued that the tolerance of quackery must be one of the most important hallmarks of a quack profession. As I still believe this to be true, I have to ask to which extend THE TOLERANCE OF SUCH EXTREME QUACKERY MAKES ACUPUNCTURISTS QUACKS? ‘Acupuncture Awareness Week’: let’s not forget our horses! The Equine Acupuncture Program…certifies students in veterinary acupuncture with an emphasis on horses. The program begins with an overview of fundamental aspects of Chinese Medicine, including Ying-Yang and Five Elements theory, which serve as a foundation for case diagnosis and treatment presented later in the class. 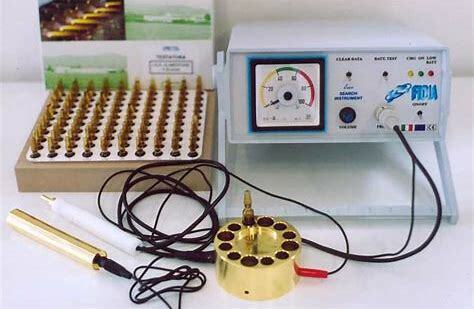 A variety of acupuncture techniques are taught, including electro-acupuncture and moxibustion, in addition to conventional “dry” needling. Students of the program learn acupuncture points on large animals only, and horses are used for practice in the wet labs. The program is presented in five sessions (two online and three on-site) over a period of six months. Online sessions are composed of lectures that students can stream at their own convenience. Afternoon wet-labs of on-site sessions give students the opportunity to learn acupuncture points on live animals in small lab groups of five to six students per instructor. A spring class and a fall class are held each year. Equine Acupuncture is offered to licensed veterinarians and veterinary school junior/senior students only. But is there not something missing, I asked myself when I read this. What about the evidence? What about the question whether there is any proof that any of this works? What a pity that the pupils of the above course are not being told that THERE IS NO COMPELLING EVIDENCE that any of the tings they are about to learn has any value…but that would be bad for business, wouldn’t it? And we cannot have a bit of evidence jeopardize a nice little earner, can we?